HENDERSON, Nev. – The Henderson Chamber of Commerce raised $7,300 as part of the Coaches vs. Cancer Suits and Sneakers Challenge benefiting American Cancer Society research, free patient and caregiver services, education and advocacy programs. Each season during Suits And Sneakers Awareness weekend, basketball coaches trade their dress shoes for sneakers on the sidelines to bring awareness to the fight against cancer. As part of their Community Day initiative, Henderson Chamber of Commerce members joined the coaches’ effort by lacing up sneakers for a workplace challenge on Monday, April 7 – the day of the NCAA men’s basketball national championship game. 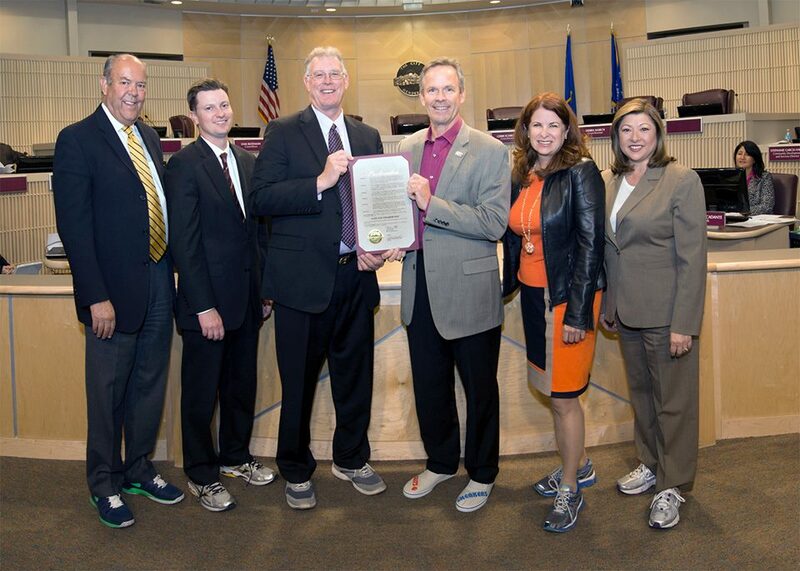 During this time, the chamber held a sneaker design competition where those who donated were urged to design a pair of sneakers, with the winner winning a $100 Zappos gift card. A team from Nevada State College won the contest. Coaches vs. Cancer is a partnership between the American Cancer Society and the National Association of Basketball Coaches. Southern Nevada has a strong tie to the Coaches vs. Cancer effort. MGM Grand is host to the annual Coaches vs. Cancer Las Vegas Golf Classic, in its seventh year this May, which features 20 coaches from around the nation, including Rice. Oklahoma coach Lon Kruger – who was the former UNLV coach – began the LV Golf Classic and still plays a key role.